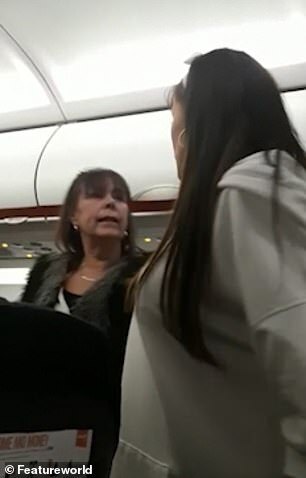 Shocking footage shows a drunk easyJet passenger launching a foul-mouthed rant at cabin crew after a flight was forced to divert when she became abusive. 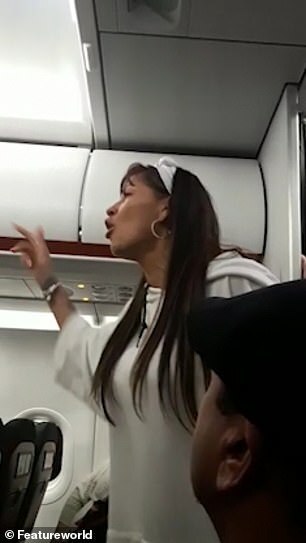 Witnesses said the woman started becoming abusive in mid-air on the flight from Manchester to Agadir, Morocco. The pilot was then forced to divert, and after it landed in Casablanca and waited on the tarmac she was filmed arguing with the air steward. 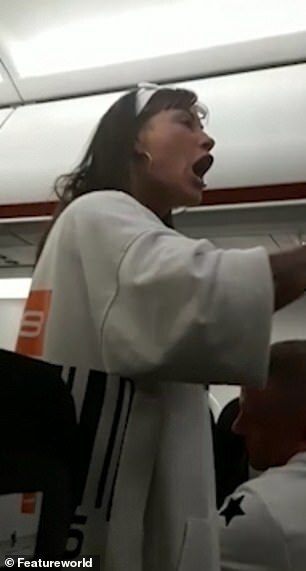 Eventually she is forced to make her way off, sparking a round of applause from other passengers as others started booing her. 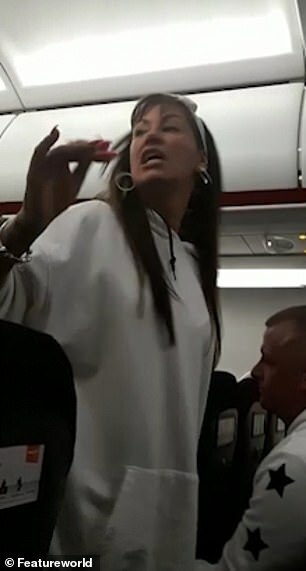 In the expletive-laden rant, the woman shouts at the air steward: 'I've done nothing wrong. 'I'm not going to be made to look like a little c*** yeah, in the whole of the f*****g thing yeah, when I've done nothing wrong. She then responds: 'Why? For what? For having a f****** good time because you are all boring c****? She replies: 'I can't wait to f****** get to the f****** front' as she storms off. Witnesses said she was one member of a family who caused havoc on the flight. 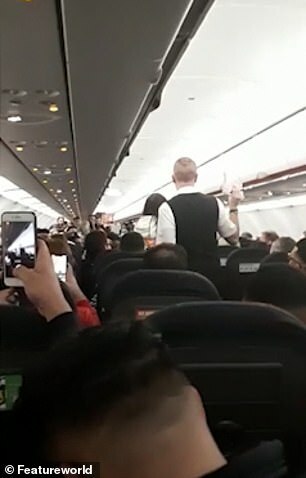 The passenger who filmed the incident said: 'It was really horrible to be on a flight in mid air with someone being so aggressive. 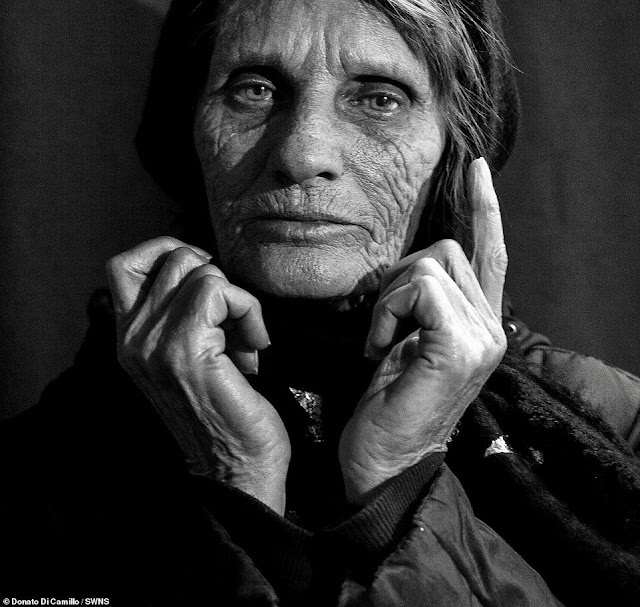 'A mother and daughter, who'd been drinking their own alcohol, were very drunk and the men they were with were winding them up. 'When the cabin crew told them to calm down it all kicked off. The daughter was being really aggressive. One of the cabin crew said he was kicked by one of them. The diversion to Casablanca added three hours to the flight journey. The witness, 56, who was going on holiday with her husband and son, added: 'Although it was annoying to be diverted the pilot did the right thing. 'The cabin crew had tried everything to calm the women down but nothing worked. She was out of control. Under UK Aviation laws it is an offence to be drunk on an aircraft and offenders can receive a maximum sentence of two years' imprisonment. Due to the rise in such incidents, the Civil Aviation Authority has brought in a voluntary code recommending airports and airlines should work together to limit disruptive behaviour. 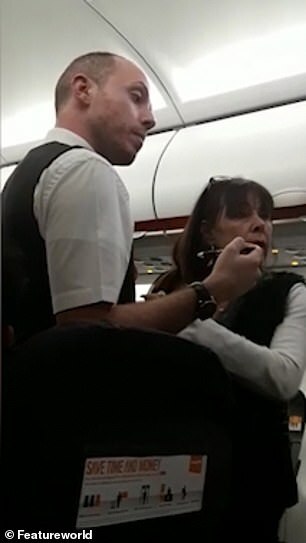 An easyjet spokesperson said: 'easyJet can confirm that flight EZY1905 from Manchester to Agadir on 20 January diverted to Casablanca as a result of three passengers behaving disruptively onboard after consuming their own alcohol. 'For the safety of all on board it is prohibited for passengers to drink alcohol purchased in the airport during the flight. 'easyJet's crew are trained to assess and evaluate all situations and to act quickly and appropriately as they did on this occasion to ensure that the safety of passengers is not compromised at any time. 'The safety and wellbeing of passengers and crew is always easyJet's priority.